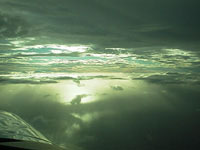 Getting ready for the departure from Fiji toward Australia was, thankfully for my now depressed mood, quite comical. There were four "handlers" helping me fuel the airplane. Since three of the fuel tanks were inside the cockpit, I insisted on filling those myself. After all, I would certainly be less likely than anyone else to spill gas or bang the spigot against a delicate instrument or something. Right? Wrong! While the mechanic assigned to oversee the refueling was debating with me about the exact ratio between liters and US gallons, the inevitable happened. The fuel truck was dispensing gas in liters, but my tanks are all sized in U. S. gallons. There were no gauges or level markers in the cockpit tanks, so we had to know EXACTLY how much we were squirting in to avert an overflow. It's impossible to see the level rising in the tanks, as they fill from the top, right near the airplane's ceiling, and I couldn't see into the port while filling it. A little miscalculation in this case resulted in the very robust fuel pump in the truck dumping about a gallon of excess fuel all over the cockpit as the middle tank filled much more quickly than expected and gushed out in a torrent. I'd love to have found someone else to blame for this, but that would have been hard to do as I stood holding the spigot myself! It took an hour and a half to scrub out that smelly gas and make the cockpit a tolerable (and nonexplosive) environment again. Many thanks to the Fijians for all their help in the cleanup project! By the time I got around to filling the last (rear) ferry tank, I was a little hesitant about topping it off, so I took an extra few minutes to recalculate my estimated fuel requirements for the trip to Brisbane based on a brand new "winds aloft" forecast. As it turned out, anything in that rear tank would be just extra reserves, so I only filled it about half way. (By now we had all agreed on the exact ratio of liters to gallons, right out to the third decimal point!) Having the rear tank down by about 25 gallons saved me nearly 150 lbs in fuel weight. As I climbed out from Fiji's Nadi International Airport, the colors of the coral reef encircled coastline were indescribable. I snapped the picture of that view shown below, although the poor resolution seen with a digital camera can never do justice to the natural beauty I observed. The flight took a little over 10 hours total. 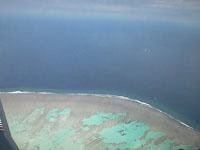 Right about halfway to Brisbane I passed over New Caledonia, climbing to 7,000 feet to stay safely above its tall peaks. There was some air traffic in the area, probably island hopping commuter planes, but this time they were all chattering in French. The local air traffic controller spoke to them in French as well, but she switched effortlessly to English whenever it became necessary to converse with me. I tried to remember enough of my eighth grade French to jot down on a notepad position reports that I could read off when it came time for me to announce my position, but in each case I chickened out and just did the deed in drab old English. As I crossed over the mountainous, yet very lush countryside, the controller surprised me with approach instructions for New Caledonia's Noumea Airport. Since I had no intention of landing there, I reminded her that I was merely overflying her country, as a means of reaching Australia. She immediately corrected herself, apparently realizing that my flight plan was for an overflight, and not for a landing. "How does our country look from up there?" she asked in a friendly French accent. "Beautiful!" I responded. "Well, then why don't you just drop in?" came the retort. I had to admit that this was the first time in 24 years of flying that any controller had given me a sales pitch like this! Still, I had another five hours to go, and the handlers were awaiting my arrival in Brisbane, so I just waved good-bye to New Caledonia as it passed beneath the wings and flew on. It felt good to be back in radar contact again as I approached Brisbane International Airport. This was the first time I'd been on a radar scope (that I knew of, that is) since leaving Hawaii. In the States radar coverage is pretty much universal nationwide, and with it helpful ATC controllers give pilots immediate warnings of nearby air traffic, high terrain or other ground based obstacles, and thunderstorm activity. The Australian customs and immigration officials were the friendliest yet. Three of them came right out to the airplane as I taxied up, and as soon as the engine was shut down they welcomed me to Australia and sped me through the paperwork process right there. I learned that it was a good thing that I hadn't succumbed to temptation and bought any of the trinkets sold outside those Fijian homes. Apparently the wood used in Fiji for carving souvenirs and the shells used to make jewelry can be contaminated with various objectionable bugs, and as a result they aren't admissible into Australia unless inspected and thoroughly decontaminated. The next day I flew the airplane over to Brisbane's Archerfield Airport, a smaller field on the South side of town where all the light general aviation planes in the area tend to be based. It was there that I had been scheduled for an oil change and a quick re-inspection by Ian Callander and his crew at Ian Aviation. As at Leahy Aviation in Hayward and Orchid Isle Aviation in Hilo, I was shown a warm welcome and given excellent service by Ian and his team. The short flight from Brisbane International could certainly go into the record books for the largest number of communications repeats and "readbacks" between native English speakers ever in the history of aviation. Given my Michigan accent and the Aussie controllers' own incomprehensible dialect, it was amazing we could understand each other at all! We managed to get the main messages across to each other, but not without considerable effort on the part of all hands! The French controller in New Caledonia was far easier for me to understand than these folks. Still, courtesy goes a long way in these kinds of situations, and the Australians are famous for their congeniality. Thank goodness! Brisbane is the city I picked in Australia for my landfall merely because friend and Plane and Pilot magazine editor Bill Cox had recommended it to me as being very convenient for pilots of small planes. There are two major airports, and between the two you can get just about any services you need in aviation, and at reasonable prices. 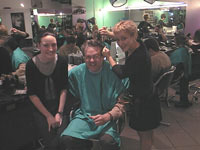 As it turned out, going to Brisbane was an excellent choice for another reason as well. It's a terrific place to visit! Modern, spotlessly clean, and informal, yet well appointed with all the things that make any city great: a nice architectural skyline, a picturesque river flowing gently through the city center, a convenient open shopping mall right downtown, an impressive performing arts complex that ranks very closely with Lincoln Center in New York, a museum, and perhaps best of all, year 'round sunshine! It can get hot here in the summer (that's during our winter), but otherwise the weather is magnificent virtually all the time. 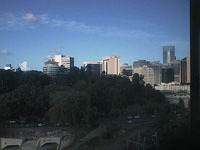 I've attached a photo of Brisbane's skyline as seen from my hotel window. Relieved to be back in civilization where I could drink the tap water without worrying about either catching some dreaded stomach bug or depleting the local reservoir, I decided to "walk the town." It's a great place. I even bought a tie, fashioned some semblance of a dress shirt by removing the wings, ID badge, and shoulder boards from my pilot's uniform shirt, and went to the symphony. I was a little out of place in sneakers and without a suit jacket or blazer, but after all, there's only so much you can stuff into a Mooney! Two orchestras and three choirs were assembled under the capable baton of Maestro Tang for a very impressive performance of Mahler's challenging third symphony. Brisbane will definitely join my list of favorite places to visit. Taking off over Fiji's beautiful coastline. Colorful sunset over the Coral Sea between New Caledonia and Australia. 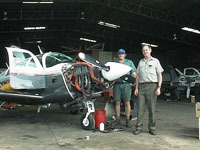 Keith and Ian, of Ian Aviation in Brisbane, Australia, giving the Mooney it's third oil change since leaving the US east coast. Brisbane skyline from my hotel window.